Lisa O'Neill scored a first Festival victory on her first ride at the meeting, partnering the Gordon Elliott-trained Tiger Roll, a 16/1 shot, to win by three lengths over Missed Approach. Warren Greatrex was delighted with the run of 50/1 shot Missed Approach who finished an excellent three length second to Gordon Elliott's 16/1 winner Tiger Roll. Greatrex also outlined future plans for the son of Golan, remarking: "We could look at the Scottish Grand National with him as he stays every yard. Willie Mullins and son Patrick combined to bring the Irish National-entered Haymount into third place. Willie Mullins, who trains the eight year old, a 33/1 chance, said: "He ran a bit keen in the race but ran well. We're very happy with him. 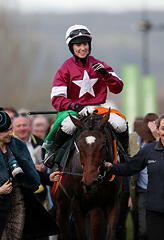 The Irish Grand National would look an option for him but we will see how he comes out of this first." Patrick Mullins, who rode the Presenting gelding for his father, added: "He just ran too keen but will be a great ride in the Irish National." The National Hunt Chase has been run more times – 145 - than any other race at The Festival. Until the 1930s, only the Grand National was more important than the National Hunt Chase in the Jump calendar. The race had been run at a number of venues until it became a part of the new two-day National Hunt Festival at Cheltenham in 1911. It had also been run at Cheltenham in 1904 and 1905. This year’s National Hunt Chase, which has been upgraded to Grade Two status, is run in honour J T McNamara, one of the finest amateur jockeys of all time who passed away at the age of 41 in July, 2016. McNamara partnered more than 700 winners under Rules and in point-to-points during his long career and was especially at home at Cheltenham and The Festival. His total winning tally at the Home of Jump Racing came to 16, four of which were at The Festival including two victories in the National Hunt Chase on Rith Dubh (2002) and Teaforthree (2012). He was seriously injured in a fall at The Festival in 2013, which left him paralysed.